2 Toon Link same as Link??? 20 Why are all the images of lower quality? 21 All sprites have been uploaded! Enjoy. 22 Someone uploaded all the costume sounds. 23 Proposal: Costume Mario Sprites- accurate or visible? 24.1 Keep the size, change the background. 24.2 100px, change the background. 24.3 3X the size, change the background. 27 Which pose are we using for the costume images? 29 Mario Land Sky Pop Mario Costume Found by Dataminers. 30 you guys think you could get some sprites? Toon Link same as Link??? Since they revealed more costumes, I just saw DK's 8-bit sprite from the Super Mario Maker's official website http://www.nintendo.co.jp/wiiu/amaj/index.html. Should we add Tingle to this page or not? 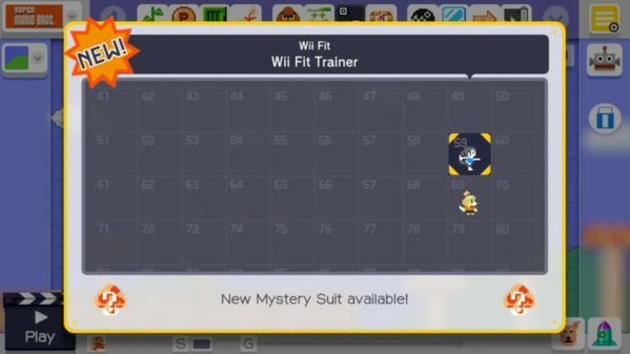 With a new video out, the Wii Fit Trainer has a different number than in the E3 footage, which almost makes it seem random. Which I would say if the Mario characters didn't occupy very proximal numbers. My guess is that there were some revisions of the game, and the WFT having the number 59 seems to be a beta element. 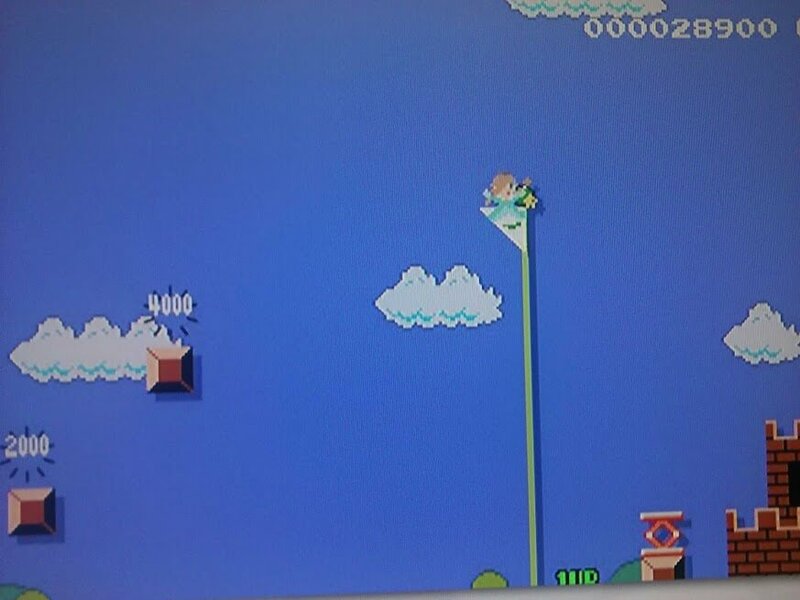 Some guy on miiverse posted a pic of Duck Hunt Dog in Super Mario Maker. I uploaded it to my photobucket before it got removed (it still hasn't). Can someone add it for me? Maybe down the road, but I never saw them on that video showing all the costumes so perhaps they'll be added later. Can't say for sure though. Tails777 Talk to me! I think that it only happens if the player has a large YouTube audience and/or media audience, e.g. Gamexplain or IGN. I doubt that the guys from the spriter's resource both have a press release copy and an account here. Why are all the images of lower quality? All sprites have been uploaded! Enjoy. Someone uploaded all the costume sounds. http://www.sounds-resource.com/wii_u/supermariomaker/sound/4826/ We could use this for the costume list. Something like [Name] | [Image] | [Jump] | [Special] | [Death] ect. The preceding unsigned comment was added by Damonj17 (talk). Proposal: Costume Mario Sprites- accurate or visible? Well then. There has been a bit of a disagreement on whether or not we should resize the sprites in the Mystery Suits table, even resulting in a borderline edit war (no fingers pointed at anyone). The advantages of not resizing the sprites is that they are more accurate and consistent to, say, Super Mario Bros.. However, I can say that I can barely see them in their current size, especially with good old Necky towering over them all. Right now, I would rather resize them slightly, but I'm going to wait to see what you guys think first. Baby Luigi (talk) I have trouble with my vision (it's about -5.00 in my left eye, which is unable to read the large E in eye exams, to get the idea of how bad my vision actually is; my right eye has refractive amblyopia on the other hand.) and I can see the sprites perfectly fine. Also, what size do you want them to be? I'll oppose 100px size sprites, simply because they're too huge for small sprites. The reason we leave them this size is the same reason we don't artificially increase the size of 8-bit screenshots or sprites in the wiki; it's because it's not the actual size of the image. We shrink images in order for them not only to actually display them in the page, but to lower the loading times as well. What does making it large does? The main issue with these sprites is not because of their size, but their relatively low contrast they have to the background compared to other sprites, due to a lack of a black outline, like any 8-bit sprite, not because they're small. We don't enlarge any other sprite in this wiki when we display them on their respective pages, neither should we make them large because people can't "see" them. Roy Koopa (talk) Big = Blurry. Blurry = Bad. Bazooka Mario (talk) I've been strongly supporting keeping them at native sizes in the comments around here, so per those and the ugly infant who voted. SuperYoshiBros (talk) Per Baby Luigi. PowerKamek (talk) I have good vision, but they do look blurry to me when they are too big. I'd rather have them small so they have better quality or whatever. Per Baby Luigi. Yoshi876 (talk) Per Baby Luigi on the consistency across the wiki. Corrin (talk)I agree with FlamingJumpCat (talk) and Pyro Guy (talk) on this one. While I understand and agree on Bazooka Mario (talk) and Baby Luigi (talk)'s reasons for keeping the sprites at their natural size, I also have vision problems (ie. a stigmatism) and I can barely see them. I think it's a better idea to give them 42px code, that way the the image files stay their natural size, but on the table they appear visible. Mariobro101 (talk)I do understand why people would argue how the images should stay the same, but, like FlamingJumpCat (talk) & Corrin (talk), I think it should be slightly bigger so you can see all of the details on the sprite without it being blurry as much. Also, when I did edit it yesterday, I put it at 100px, & then I realized that they were too big, so then they were changed back. But, testing out smaller sizes, like I said before, it works well. ChromStrikes (talk) I don't get how the bigger ones are blurry? They're literally sharp pixels, there's no blurring in the images at all. The Pyro Guy (talk) I think that I'm gonna vote big, mainly because I don't wanna go through a long process just to look at an 8-bit image in detail. Despite Baby Luigi's points (that I agree with) the benefits of resiIng outweigh the disadvantages, IMO. 35-45px would be good. God no, even I think 100px would be too huge (http://imgur.com/rgzimgy this is 100px), and I tried preview-coding them to 20px and 30px but they both look streched out, which is why I still believe a coding like 39px (http://imgur.com/fYkvUOl) is the best outcome. I agree with Baby Luigi and Walkazo. Now, 100px and 4X is too big. Black is also a bad colour to use, as it still blends in with some characters. The natural size and maybe 2X is, in my opinion, too small. 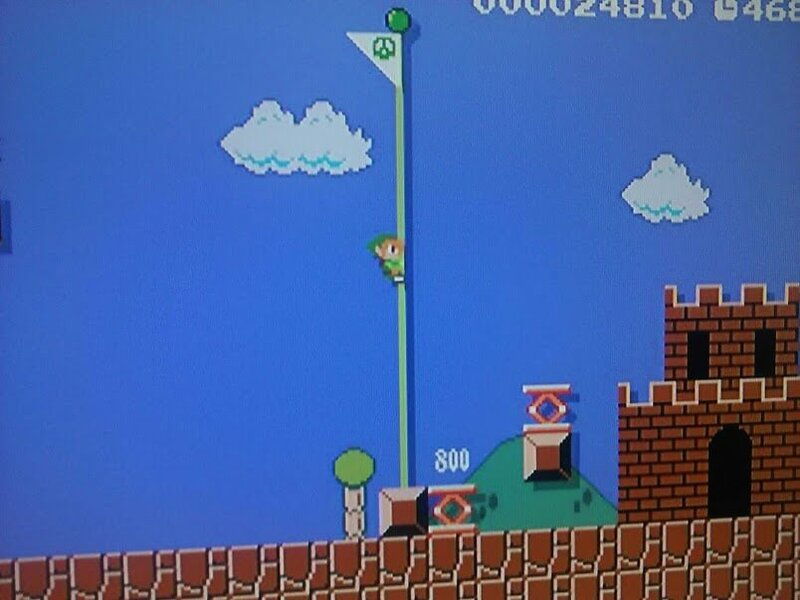 But I think that 3X the size is just right, along with a sky blue background, seen in SMB. I've also done a complete reset of votes due to drastic changes. Thanks for reading and please leave a vote. Keep the size, change the background. Wario W. 97 (talk) BIGGER AND BETTER, also manage each sprite with an opposite color background. Not only black and white, but blue and other colored background will 'remove' many pixels of a character. 3X the size, change the background. The Pyro Guy (talk) Per proposal and Walkazo and more in the comments. Baby Luigi (talk) I'll just settle on this. Per all. FlamingJumpCat (talk) This would be the my prefered option, not too big and perfect background colour. Corrin (talk)As I said in the 1st proposal, the silver background has got to go. I'm not against 4X the size, but 3X the size is a way better compromise. Bazooka Mario (talk) I'm concerned about the other sprites in the wiki, but if the sizes of these sprites in particular is the problem, then a small resize would do no harm. Walkazo (talk) - Per me in the above comments: SMB sprites are meant to stand out against the blue sky background, and the 3x magnification seems like a good size: not too small, not too big. Heck, I'd actually get behind doing similar magnification to other sprite tables too, not just here. PowerKamek (talk) Per all. Looks better. Roy Koopa (talk) Per Corrin. Tails777 (talk) Per all... again. DryKirby64 (talk) Per all; it matches the in-game graphics best for easy viewing. Megadardery (talk)Exactly per Walkazo, the sprite does seem small in 1X and 2X, but also appears rather big in 4X and 100px that it starts to lose details. So resizing it to 3X seems logical, especially since Chrome now supports nearest-neighbor scaling. RandomYoshi (talk) – Per all. Could you show what your idea is, maybe in a preview and screenshot? I'm interested in seeing it. Which pose are we using for the costume images? Mario Land Sky Pop Mario Costume Found by Dataminers. you guys think you could get some sprites? The preceding unsigned comment was added by 76.111.178.46 (talk). ...then why do you have birdo, bike, etc. besides, the hackers say it's going to be near impossible to get those sprites. ignoring existing resources to get a form of consistency that will be near impossible is... well, a completely brainless action that only mariowiki would consider proper. This page was last edited on November 12, 2018, at 12:54.